Wide angle view of the Victoriana Theatre on the Carnival Freedom cruise ship. Belonging to Carnival Cruise Lines. Underwater photo while at the Stingray City attraction at Cayman Islands. While on excursion from Carnival Freedom. 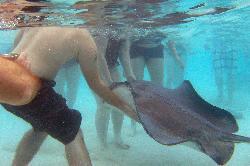 Stingray excursion from Carnival Cruise Lines at Grand Cayman Islands. A view into Scott's Piano Bar, aboard the Carnival Freedom Cruise Ship. Located on the Promenade Deck on level 5. The buffet serving area in the Lido restaurant on the Carnival Freedom cruise ship. The Pizzeria restaurant on the Carnival Freedom cruise ship. A view into the Posh Aft Dining Room on the Carnival Freedom cruise ship. from site: A cruise ship or cruise liner is a passenger ship used for pleasure voyages, where the voyage itself and the ship's amenities are a part of the experience, as well as the different destinations along the way. Transportation is not the prime purpose, as cruise ships operate mostly on routes that return passengers to their originating port, so the ports of call are usually in a specified region of a continent. From site: Carnival is The World's Most Popular Cruise Line, with 22 Fun Ships operating voyages ranging from three to 16 days in length to The Bahamas, Caribbean, Mexican Riviera, Alaska, Hawaii, Canada, New England, Europe, and Bermuda. Carnival Freedom details as described bu Carnival Cruise Lines.